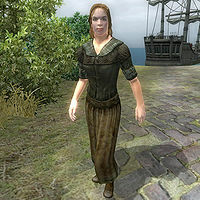 Helga Open-Legs is a Nord rogue widely known for being a prostitute, as her name implies. 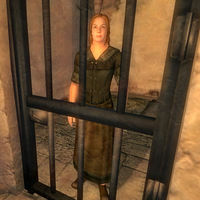 She is currently imprisoned because of her profession, ever since Dupineon reported her to the guards after she failed to seduce him. Before the related quests are active, she will be quite sullen when greeting you, "What do you want? Unless you're here to to [sic] pay my fine, I don't see why you'd want to visit me." After this warm welcome, she won't have any other dialogue options. If you speak to her again, she'll regain some of her sensuality and say, "I'm Helga, they call me Open-Legs. When I get out of this dump, find me. I'll lend you my services, if you know what I mean." After that, she will revert back to wandering around her cell. She spends most of her day like this, breaking off at 2am for a short four hour nap. Once you pay her fine, she will follow the jailor outside and then permanently position herself on the bench in the nearby gardens with a promise: "Thanks for your help getting me out of prison! I'm going to try to find a job that's more acceptable to the locals. Just until I can earn the money to get off this rock." Once she's out, you can ask her about the island and she'll reply, "I like it much better now. Seeing it without those bars gives the whole island a much more friendly face." Helga is central in finding out both where the Kintyra II is and where Jean Ciscotte might be. Once the locals point you towards her and you ask about the ship she will be surprised. "What? Ain't that an empress from a long time ago?" When you explain it's a vessel, she'll drop you a hint with, "What? Ship? I don't know about no ship. But maybe I might remember something if you promised to get me out." If you agree to help her, she'll go into detail and pass you a bit of Stirk gossip, "Thanks a lot! This elf who reported me, he totally got the wrong idea. His accusation is ridiculous. I don't think he's interested in women, to be honest," and "Accursed ship! It was awful. I was aboard that ship, bound for Anvil to visit a cousin. One night the first mate told us that we were going to be arriving at Stirk the next morning. But in the middle of the night I awoke to a huge cracking sound. When I went out into the hall, water was pouring in. It wasn't long before the ship was sinking, and fast. I escaped, floating to shore on a piece of driftwood. But I saw something in the wreckage: a smaller boat. I considered climbing into it, as I had seen some men do. Then I saw those wicked creatures. Goblins! I don't know who those men that got into the boat were, and I don't know what happened to them. Your best bet is to track down those goblins. Now hurry up and get me out of this place." Prostitution doesn't seem to be paying off to Helga though, as she can only afford belted braies, a burlap vest and a pair of clogs. She also carries a few gold coins. Helga's Fine: Pay the fine for a lady of the night in exchange for some vital information. The Ballad of Jean and Mori: Uncover the fate of a missing ship and reunite two young lovers. A second version of Helga is present but never appears in the game. Her class is Witch rather than Rogue, and her level is five above the PC rather than being the same value. The BaseID is xx01C3BE should you wish to spawn her using the Console. "Thanks again for your help! I've taken to the mine to earn some extra cash."